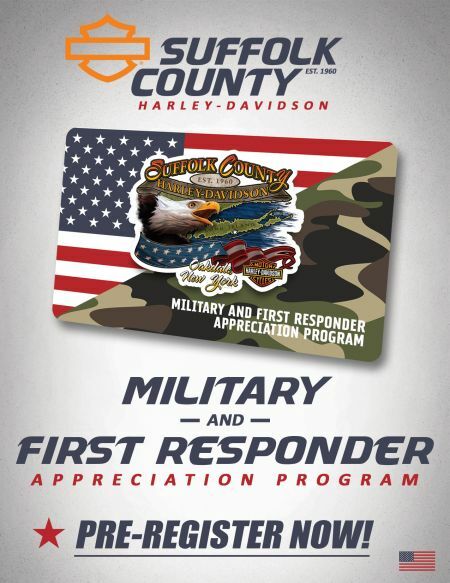 As a special thank you to those who serve or have served in the military and those who are on guard as Law Enforcement, Firefighters and EMS in our community, Suffolk County Harley-Davidson is now offering a special Appreciation Program. Suffolk County H-D's Military & First Responder Appreciation Program is only for active and retired members of an eligible First Responders Association, as well as active, retired and veteran members of an eligible military branch. This program is now available for pre-registration. » Law enforcement officers (including federal, county, city, capitol, state, village and other local officers, sheriff’s department, FBI, secret service and motor patrol) with state-sanctioned, official “arresting power” » Valid ID: Current department identification with badge number and rank or a letter from the department chief noting past service to the department. » Firefighters (including full-time, part-time, paid on-call, and volunteers) » Valid ID: Current department identification or a letter from department chief noting past service to the department.